Q10 is the very dense social housing on the former Royal Infirmary site in Edinburgh. 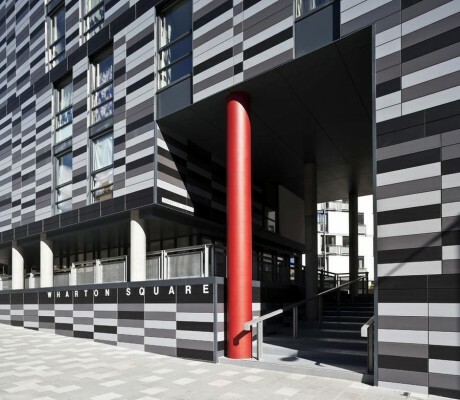 The project, , as originally designed, had its numbers and density considerably increased when the balance of residential accommodation in Foster & Partners’ masterplan was considerably increased. The resulting density of a scheme creating 174 affordable apartments in a single courtyard block broke all local guidelines. The practice proposed a version of a Wiener Hof with a single entrance to a courtyard with a lift and stair towers in each corner. 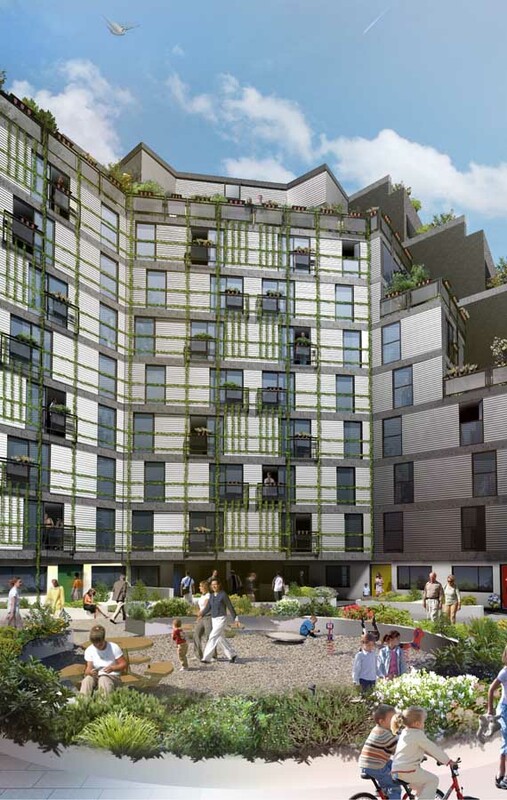 The massing is eroded towards the south west corner to admit as much sunlight as possible and in compensation for the small amount of communal space in the centre many of the flats have their own generous roof terraces and corner balconies. The exterior of mottled grey terra cotta tiles makes reference to Foster’s own (more expensive!) metallic cladding nearby. Corners are celebrated with balconies and an over sailing zinc roof. The common areas, although deep in the plan, are still naturally lit with a view to the outside at each floor. The interior of the courtyard is white render and glass with a planting regime that we hope will completely cover the elevations with greenery in time. The building will thus have a hard exterior shell but a semi-private green heart. At the ground floor there is management (concierge) office, a nursery school for 50 children and a cafe is proposed for the final commercial space. 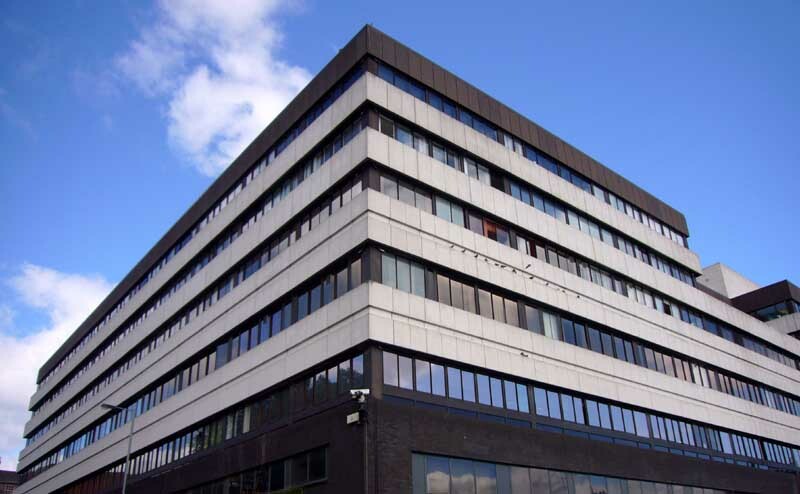 Properties: 1 and 2 bedroom apartments located off Chalmers Street, south of the city centre. 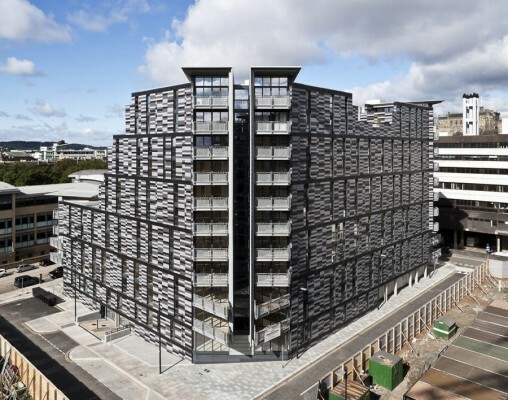 The first tenants pick up the keys to their new homes in the £23m social housing complex at Edinburgh’s Quartermile development by Richard Murphy Architects. 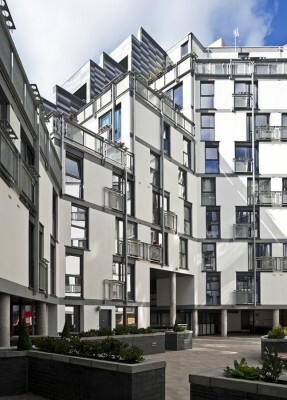 Explaining the rationale behind this move the practice said: “This layout has been developed to maximise daylight into what is, of necessity, a relatively densely designed scheme but also to create a courtyard as a social heart to the scheme based on models of similar sized city blocks in Berlin and other European cities. Q10 Quartermile – designed by Richard Murphy Architects – has topped out. The development for Hillcrest includes 174 affordable houses is under construction and due for completion during Spring and Summer 2013. 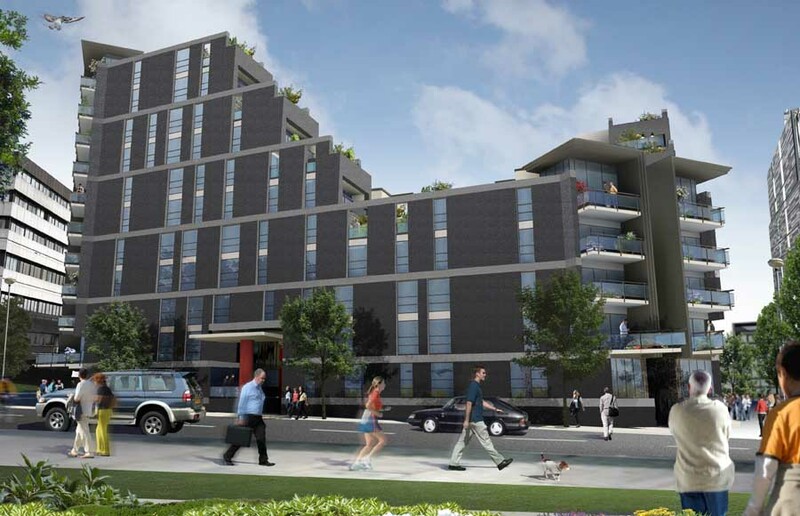 The overall increase in residential accommodation across the Quatermile site has meant a requirement for an increase in the affordable housing provision as part of the development. The general strategy within the amended masterplan is to increase the number of units on the Q10 site within the massing models developed for the overall scheme and with an emphasis on the quality of the apartments to be provided. 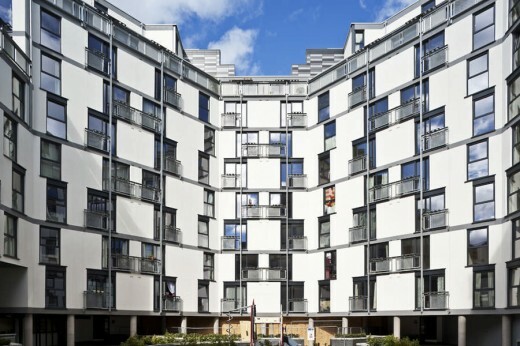 The revised strategy for the scheme arranges flats around an octagonal central courtyard. The scheme rises to 5 storeys around the shared court and then separates into corner towers which step back from the south west corner to reach a tenth storey on the north east corner. This layout has been developed to maximise daylight into what is, of necessity, a relatively densely designed scheme but also to create a courtyard as a social heart to the scheme based on models of similar sized city blocks in Berlin and other European cities. 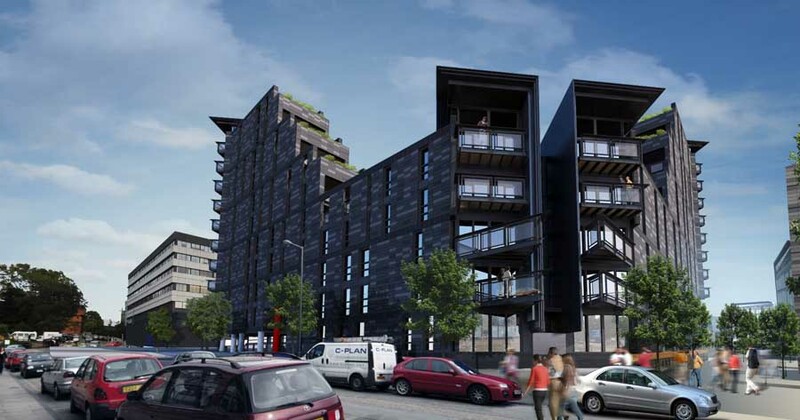 In addition it offers tenants in the upper storeys the views of the Meadows and beyond enjoyed by buyers of the other flats on the overall site. The intention throughout has been to try and maintain the amenity of all flats, maximising light and view whilst minimising the number of single aspect flats in favour of dual aspect or corner flats wherever possible. All access to the block is made via a new double height opening facing Chalmers Street which leads into the central courtyard which will form the hub of the scheme – the communal facilities on the ground floor will be accessed from here aswell as all the stair/lift cores. On the north side of this court we have proposed commercial/lettable space in the areas which would be least appropriate for flats. This courtyard is a semi-public space for the residents which may also benefit from a concierge/building managers office, dependant on the eventual use of the commercial space, central play area and possibly also a nursery. The project has planning consent, building warrant and has finally received funding approval in October 2010. Construction is due to start in January 2011. 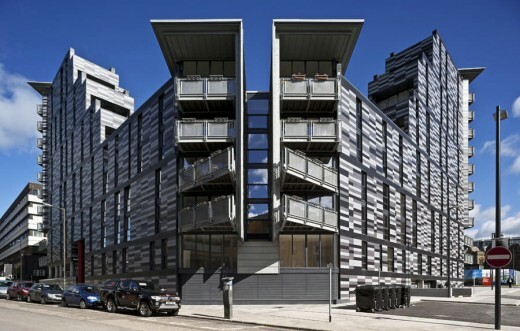 CDA have recently completed some of the Conversion flats at Quartermile. These are the apartments in the 4 Victorian (former ward) buildings, of which there are now 24 flats in each block. The hospital has relocated to a new £184m building at Little France, south-east Edinburgh: New Royal Infirmary. 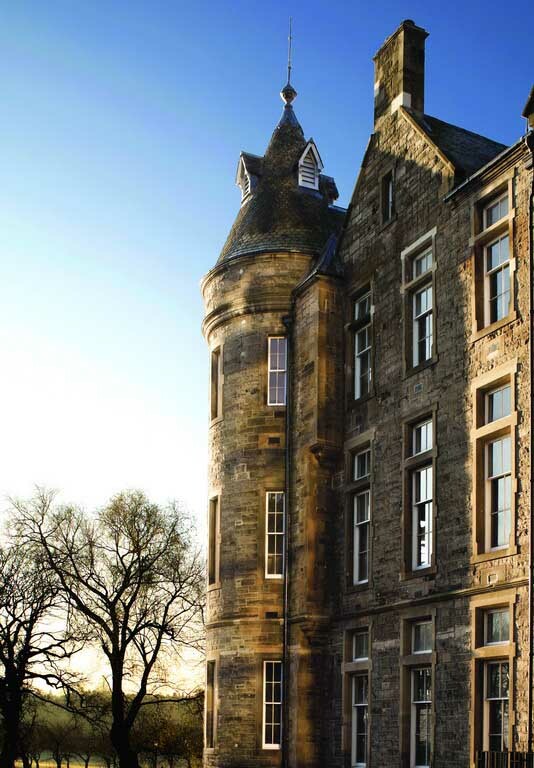 Richard Murphy’s project for a five star hotel within the surgical hospital of the Edinburgh Royal Infirmary went public with the submission of a planning application. Richard Murphy Architects’ planning application is as part of a wider application submitted by Southside Investment Ltd for their renewal project for the hospital as a whole entitled Quartermile Edinburgh. The Quartermile site plan is master planned by Foster Associates and Richard Murphy Architects’ hotel involves the demolition of all the non David Bryce buildings to the south of the surgical hospital and their substitution with shops, ballroom, foyer, offices, garden and winter garden with the conversion of the six wings of David Bryce’s building. A five star hotel is a complex building type and the design is further complicated by the need for the majority of the accommodation to be located within the existing Bryce Building. Richard Murphy Architects’ project for the five star hotel is the most complex building on the Royal Infirmary site. Richard Murphy Architects considered the remains of the William Adam Building ‘very insignificant’, and so an attempt to consider rebuilding the missing sections of the William Adam Building was abandoned. 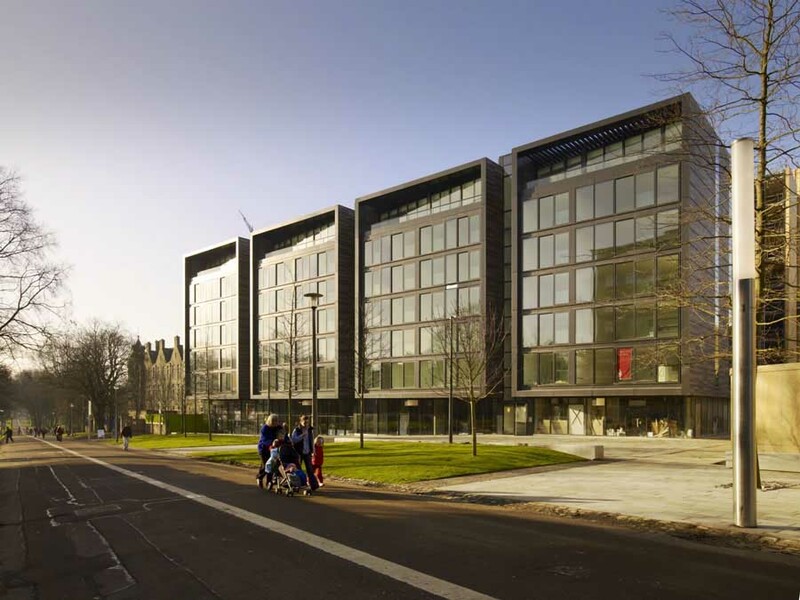 In addition Richard Murphy Architects considered that the large span spaces of a five star hotel could only be accommodated within a new building on the south side of the Quartermile site.